While presenting the Union Budget 2017-18 on February 01, 2017, the Finance Minister (FM), Arun Jaitley, allocated Rs. 3,59,854 crore (US$ 53.5 billion) to the Ministry of Defence (MoD). 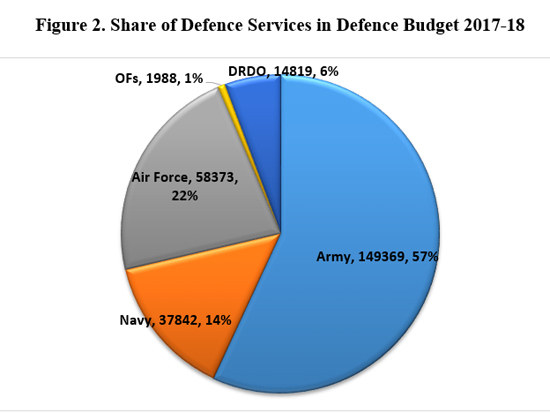 As in his previous budget, the FM also made certain changes in the format of the defence Demand for Grants (under which defence money is distributed among the armed forces and other defence agencies), bringing further complexity to the task of estimating the various heads that make up India’s official defence budget. The complexity apart, the bigger question that faces the defence community is whether the latest allocation is adequate to meet the security needs of the country. This Issue Brief examines the latest defence allocation in the light of its possible impact on modernisation and operational preparedness of the defence forces. It however, begins with a macro survey of Indian economy and the context of the Union Budget, both of which have a direct bearing on defence. Despite a gloomy global economic environment, the Indian economy continues to a bright spot, with the initial estimates of the Gross Domestic Product (GDP) showing a growth of over seven per cent per annum for three consecutive years between 2014-15 and 2016-17. The growth momentum is likely to be sustained at around 6.75-7.5 per cent in 2017-18, as projected by the latest Economic Survey. Besides the GDP growth, the economy has also witnessed other robust macro-economic indices pertaining to inflation, fiscal consolidation, current account deficit, rupee-dollar exchange rate, foreign exchange reserves and foreign investment inflows. The impressive macro fundamentals notwithstanding, the Indian economy is widely perceived to be growing at much slower than its growth potential of 8-10 per cent. There is a growing concern that the sluggish recovery of world economy and recent anti-globalisation tendencies seen in the West could affect India’s effort to push for an export-led economic development. Back home, the subdued corporate investment and depressing private final consumption expenditure are major markers of concern which, if left unaddressed, would likely halt the growth momentum. It is in this context that the Union Budget has focussed on a government-led investment approach to spur the domestic economy. Investment on infrastructure, rural economy and the like have been the primary focus of the Union Budget 2017-18. The emphasis on these sectors is such that the government has deviated from its promised fiscal consolidation path to provide extra resources on these fronts. More significantly, the deviation has come even after a hefty 17 per cent growth in the estimated gross tax receipts. From the MoD’s point of view, however, the Union Budget 2017-18 is a missed opportunity as neither the fiscal expansion nor the revenue buoyancy has resulted in a significant hike of resources. While presenting the Union Budget to the Parliament, the FM stated that “[f]or Defence expenditure excluding pensions, I have provided a sum of Rs. 2,74,114 crores including Rs. 86,488 crores for Defence capital.” The FM’s overall stated figure of Rs. 2,74,114 is, however, not what the defence ministry considers as India’s official defence budget. 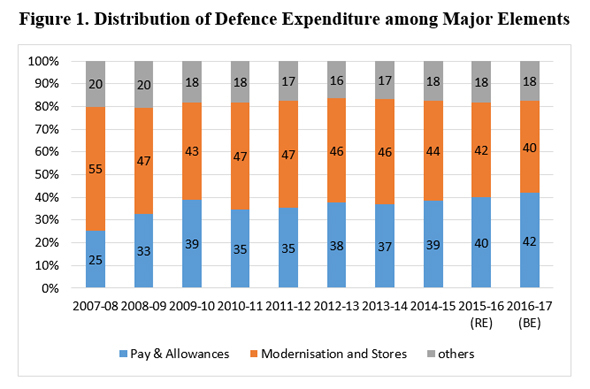 An attempt is made in Table 1 to reconcile the defence-related allocations provided in the Union Budget with the traditional format used by the MoD and compare it with the previous years’ allocation and expenditure. Using the MoD format, the defence budget for 2017-18 amounts to Rs. 2,62,390 crore. The difference in amount (between FM’s and MoD’s figures) of Rs.11,724 crore is allocated under what is considered Defence (Civil Estimates) which, inclusive of defence pension of Rs. 85,740 crore, does not form part of the official defence budget. A noticeable aspect of the Table 1 is the underutilisation of capital allocations provided in the 2016-17 budget, resulting in a surrender of Rs. 6,970 crore (8.1 per cent). The surrendered amount has largely been absorbed in the revenue expenditure which has increased from its original estimates by Rs. 5,876 crore. Note: BE: Budget Estimate; RE: Revised Estimate. Figures for 2015-16 are actual expenditure. Rs. 1.0 crore = Rs. 10 million = US$ 148772 (alternatively, $1 million = Rs. 6.7 crore) as per the average exchange rate for the first 10 months of 2016-17. Table 2 provides comparative statistics of defence budget and related figures for 2016-17 and 2017-18. The noticeable feature of the table is the further decline in the defence budget’s share in both central government expenditure and the GDP. With a share of 1.56 per cent of the estimated GDP of 2017-18, the defence budget is the lowest since 1956-57. Another major feature of Table 2 is the further increase in the share of the revenue expenditure in the total defence budget. The increase is primarily due to the hike in the manpower cost of the armed forces, which accounts for over 83 per cent (or Rs. 11,071 crore) of the overall growth of Rs. 13,291 crore in the defence budget. It is significant to note that the manpower driven defence budget is not unique to 2017-18. In the last several years, it has been a recurring feature with a debilitating effect on two vital elements of the defence budget: revenue stores and capital modernization which together play a vital role in the operational preparedness of the armed forces. As Figure 1 succinctly illustrates, the combined share of these two elements has declined from 55 per cent in 2007-08 to 40 per cent in 2016-17. This does not augur well, especially when there exists a huge void in India’ defence preparedness, and the armed forces have grave shortages in many areas ranging from ammunition, assault rifles, bullet-proof jackets, night fighting-devices to howitzers, missiles, helicopters, fighters and warships. Needless to say, for adequate defence preparedness, the present ratio needs to change for the better, for which allocation under revenue stores and capital modernisation needs to be augmented substantially. Among the defence services, the Indian Army with a budget of Rs. 1,49,369 crore accounts for the biggest share in defence budget, followed by the Air Force, Navy, Defence Research and Development Organisation (DRDO) and Ordnance Factories (OFs) (Figure 2). The lion’s share for the Army is primarily because of its overwhelmingly numerical superiority over the sister services. Accounting for over 85 per cent of the uniformed personnel, bulk of the Army’s budget goes into meeting the pay and allowances of the personnel. In 2017-18, only 17 per cent of Army’s total allocation has been earmarked for capital expenditure. The comparative figures for the Air Force and Navy are 58 per cent and 51 per cent, respectively. Note: Army includes National Cadet Corps (NCC), Rashtriya Rifles (RR), Ex-Servicemen Contribution Health Scheme (ECHS), Inspection Organisation and Military Farms. Tables 3-6 provide the modernisation budget (or the capital procurement budget) of the three forces. As can be seen, the overall allocation in the 2017-18 budget has declined, although marginally, over the previous allocation. Among the three forces, Air Force is the only service whose modernisation budget has increased whereas both the Army and Navy have witnessed a decline in their respective budgets. The increase in the Air Force’s budget is in view of its signing several mega contracts, including for the Rafale fighters, and Apache attack and Chinook heavy lift helicopters. The decline in the modernisation budget is a source of great concern, especially given the limited budgetary scope available for signing new contracts. In 2016-17, only 12 per cent of the total modernisation budget of Rs. 70,000 crore was available for signing new schemes, with the rest being earmarked for the committed liabilities arising out of contracts already signed (Table 7). It is, however, to be noted that this limited scope has not been fully exploited as there has been an underutilisation of a whopping Rs. 7,393 crore (or 10.5 per cent). The underutilisation is across the services, although the Army accounts for over 50 per cent of total unspent funds. What is of greater concern is that underutilisation has become a recurring feature of India’s defence budget, despite numerous improvements in the procurement procedures undertaken by the MoD in the past two-and-a-half decades. Given that steady modernisation is a prerequisite for building up a strong military capability, the MoD has a big task ahead to bring in efficiency and expeditiousness in the procurement process. Unlike in the previous budget, the Union Budget has not provided any specific incentives to push the Make in India initiative in the defence sector, although some industry-wide proposals have been promised. Among others, the government has promised to reduce income tax from present 30 per cent to 25 per cent for Micro, Small and Medium Enterprises (MSMEs) with an annual turnover of upto Rs. 50 crore. This is likely to benefit some 6000 MSMEs which are presently supplying parts, components and sub-systems to players like DRDO, Defence Public Sector Undertakings, OFs and the large private companies. The lack of any specific incentive for the defence industry may be a source of disappointment, as industry has repeatedly demanded certain concessions which are currently extended to other sectors. In the Union Budget itself, the FM extended the ‘Infrastructure Status’ to the ‘Affordable Housing’, sector, allowing the industry in that sector to avail certain tax-related benefits. Needless to say, Infrastructure Status is one of several demands long demanded by the defence industry. Within the defence budget, however, there has been a small allocation of Rs. 44.63 crore made for prototype development under the ‘Make’ procedures which have recently been revised by the MoD and some 23 projects have been identified for execution. Of the total amount, Rs. 30.08 crore is earmarked for Army and the balance Rs. 14.55 crore for the Air Force. The meagre increase of five per cent in the official defence budget is grossly inadequate especially in view of the vast voids existing in military capability and the diminished and incremental effect on modernisation and operational preparedness. There is a need to augment resources substantially, particularly under two critical heads of the defence budget – stores and capital procurement – which have come under severe pressure in the last several years with a huge negative consequence on India’s defence preparedness. From the MoD’s perspective, while the demand for higher allocations is a genuine one, it must also be fully geared up to utilise the available resources in a time-bound manner. There is hardly any merit in asking for more resources while the present capacity to utilise the available resources, particularly those under the capital head, is constrained. The defence establishment must, therefore, look inward and find lasting solutions to procurement impediments. At the same time, the MoD also needs to look at the current profile of the defence budget and lose no opportunity for controlling manpower costs so as to allow other items of expenditure to grow in a healthy manner.